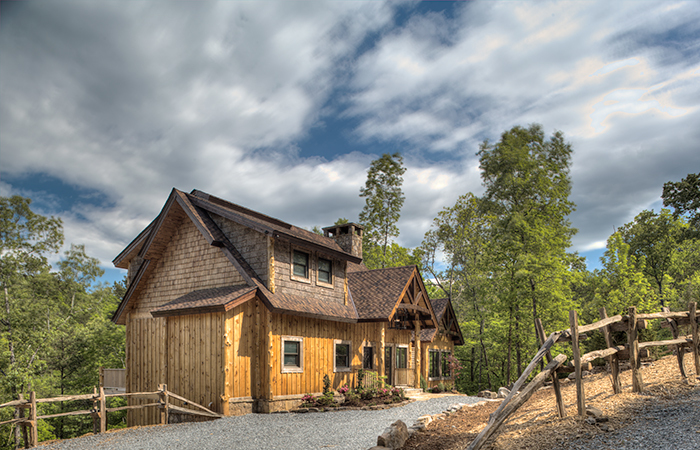 A Mayfly Lodge & Treehouse—Your Next Mountain Getaway Destination! 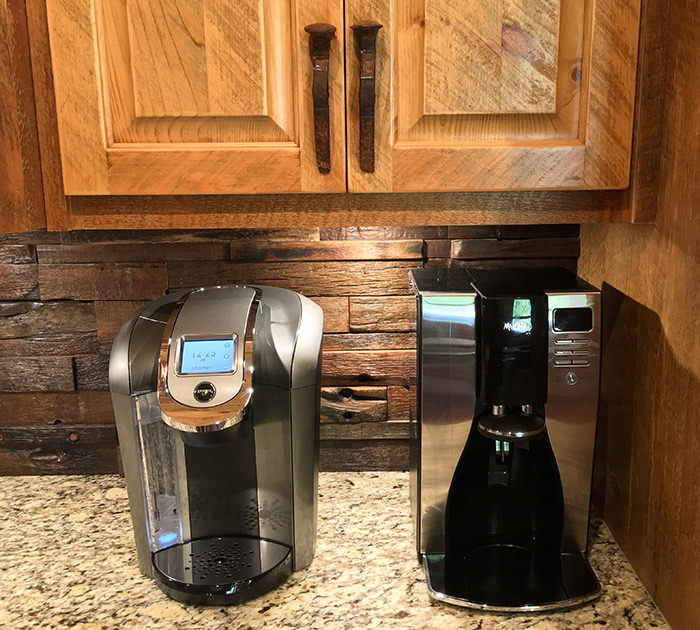 Kuerig 2.0 Coffee by the cup. 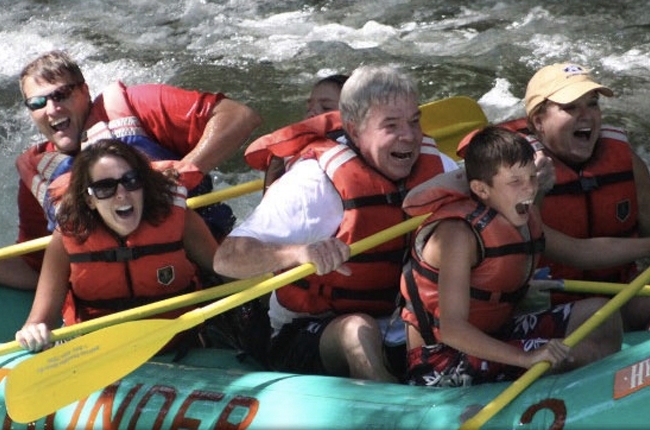 Nearby Whitewater Rafting Makes for a Great Adventure! 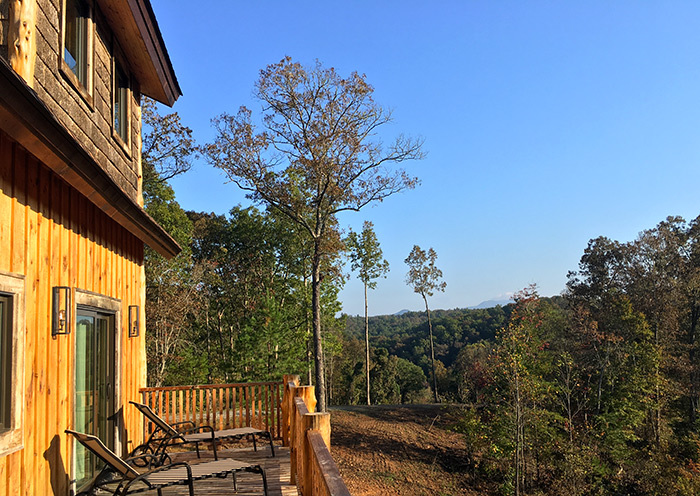 Something magical happens when you stay at this unique Blue Ridge cabin rental called Mayfly Lodge and Treehouse. 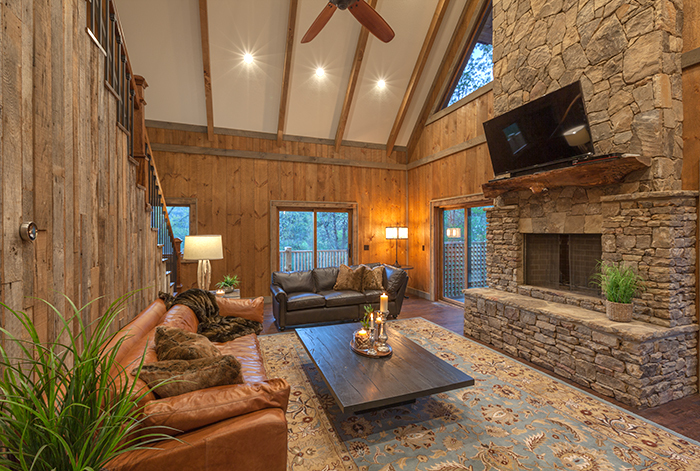 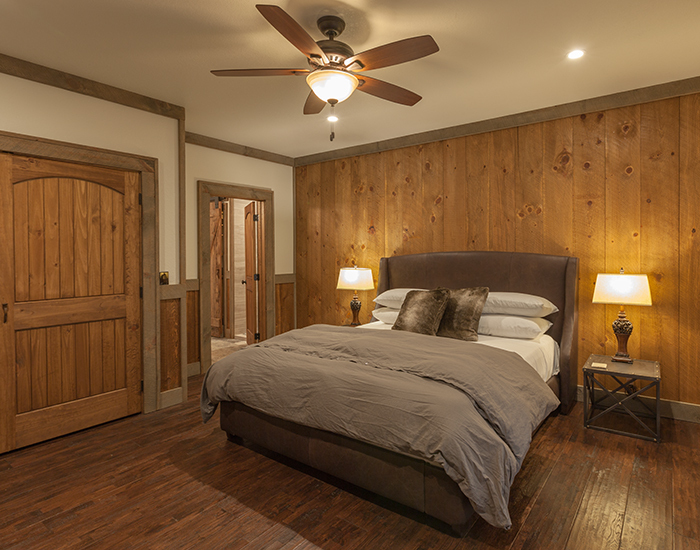 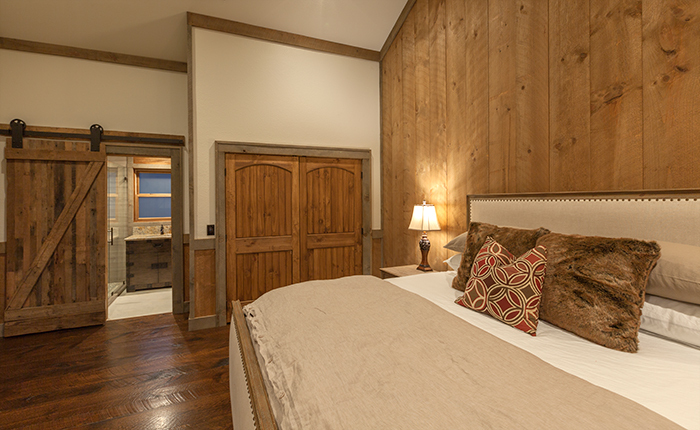 As you enter the front door to this newly constructed cabin rental near the Toccoa River, you’ll feel the cares of this world slowly slip away and ease into relaxation mode. 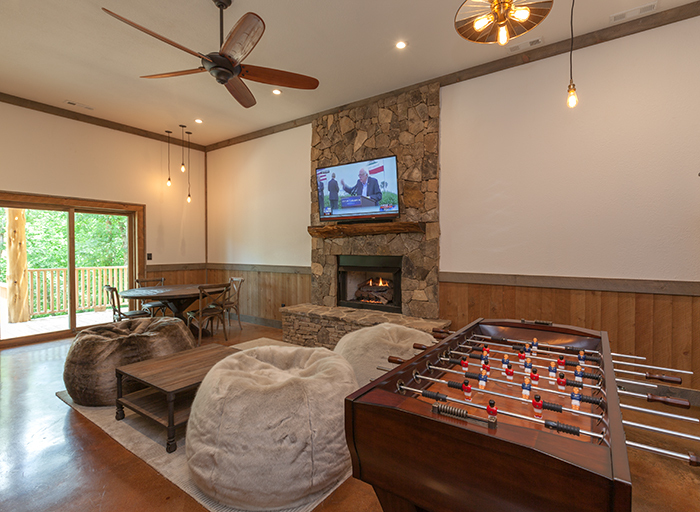 Named after the gossamer-winged mayfly that lives near the water and can be used for fishing, Mayfly Lodge and Treehouse is located in a private community near the Toccoa River just 9 miles from downtown Blue Ridge. 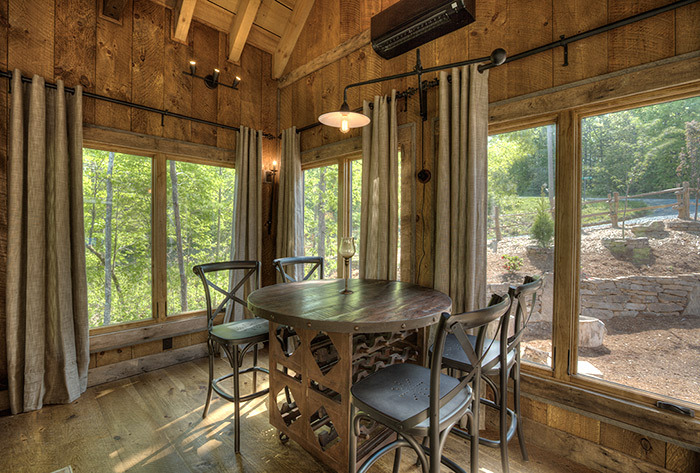 Pamper yourself in the ultimate mountain luxury experience at Mayfly Lodge and Treehouse! 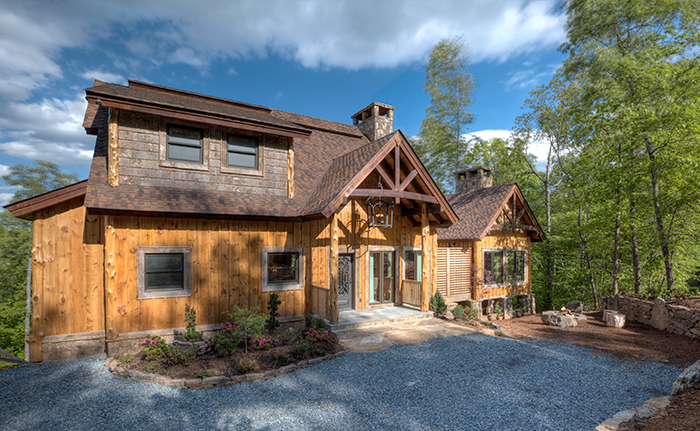 Our newest custom-built luxury Toccoa River cabin rental to join the Toccoa Heights lodge portfolio, which includes A Rolling River Cabin, Fallen Timber Lodge, Outlaw Ridge, and Riverview Lodge (also perfect for business retreats and family reunions), this home offers tasteful, beautiful amenities both inside and out pleasing all who enter. 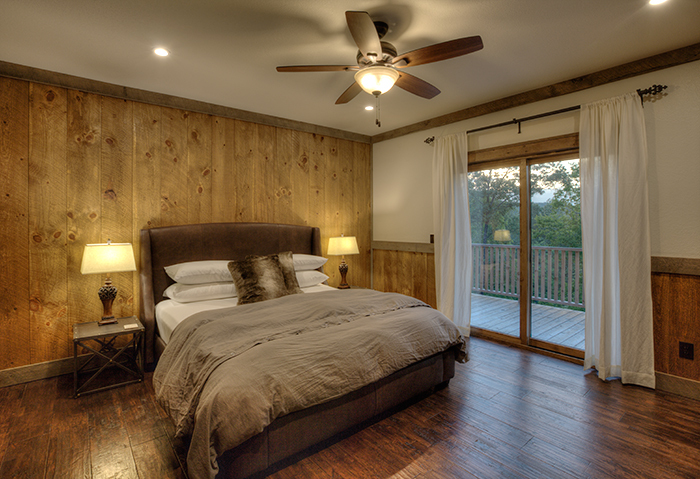 To view an immersive virtual walk-through of Mayfly Lodge and Treehouse click here. 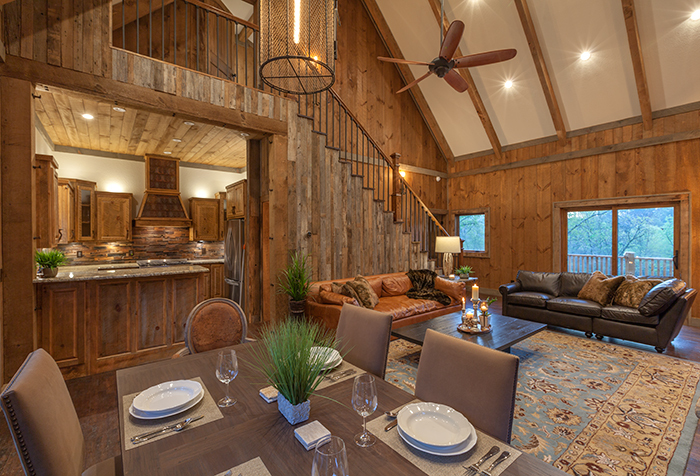 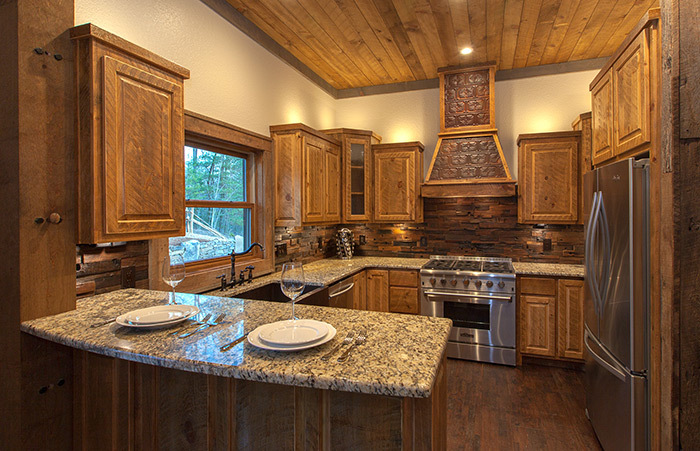 Constructed from reclaimed oak barn wood, white pine, and cedar timbers, this unique 2-bedroom, 2-bath Blue Ridge cabin is as authentic as it is breathtaking. 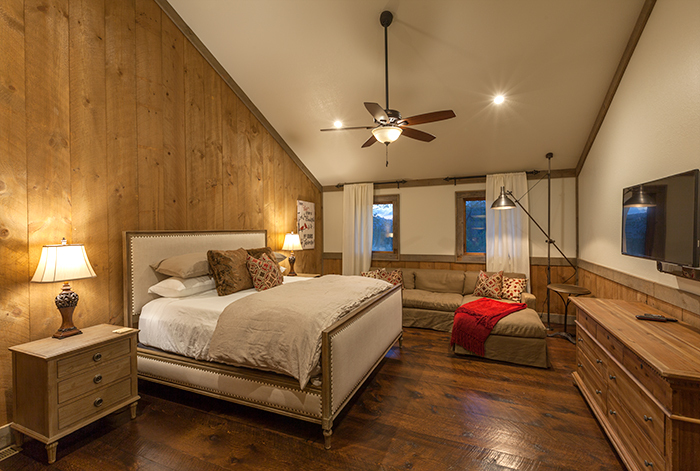 With an open floor plan, high ceilings, and luxuriously appointed with Restoration Hardware furnishings, linens, hardware, lighting, Mayfly Lodge and Treehouse envelops you with warmth and luxury. 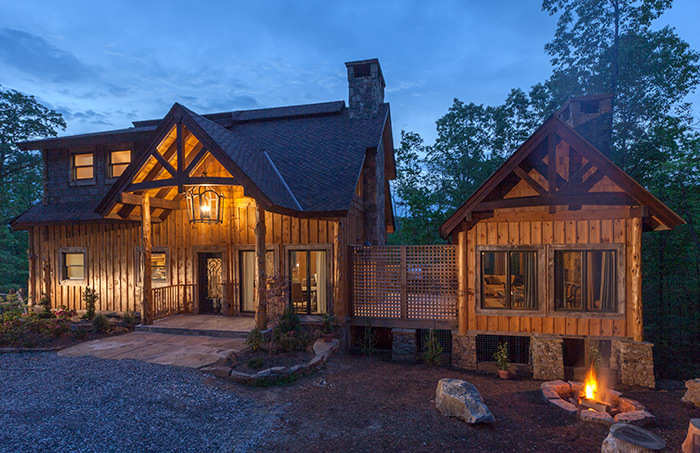 The enormous open floor plan combines a luxurious living room, with its massive stone wood-burning fireplace, oversize leather sofas, and large flat screen TV to the adjacent kitchen with a mix of rustic and modern. 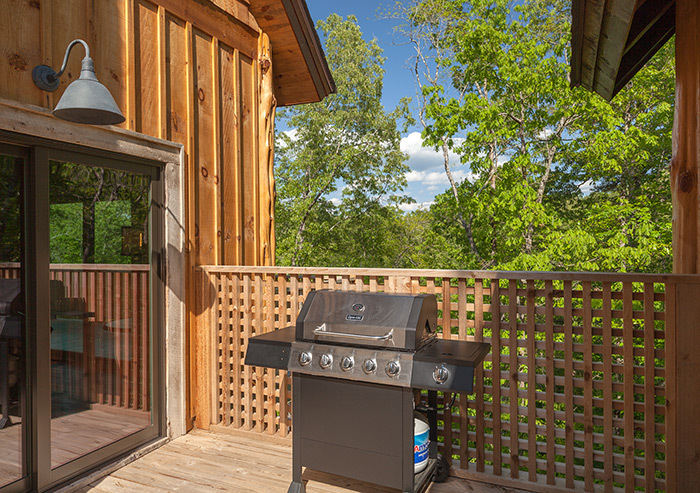 Prepare culinary delights on the Thor professional 6-gas burner extra-large stove and oven, complete with all the accoutrements needed to complete a delightful meal. 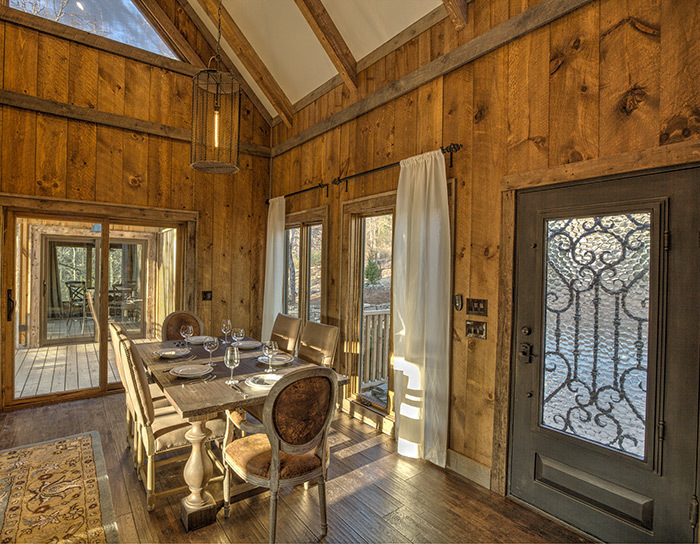 Your dining experience is complete with large windows bringing the outdoors in and enjoying a beautiful fire in the fireplace. 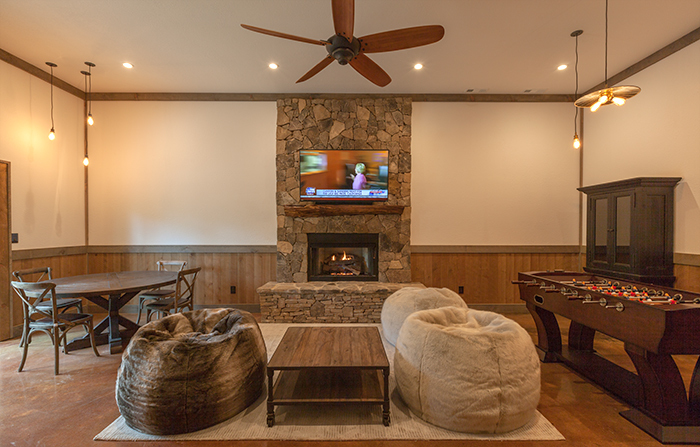 Relax and revel in luxury while snuggling under a fur throw in front of a crackling wood-burning fire, sipping a glass of wine, and watching a much-anticipated movie that you've been waiting to see. 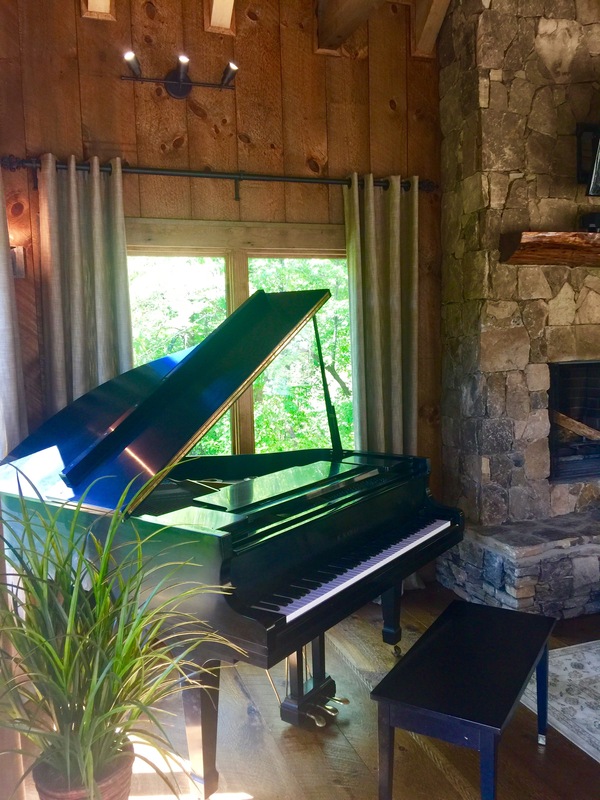 Try your hand playing your favorite pieces of music on the baby grand Kawai piano in the Treehouse with walls of windows (that open) all around, bringing the wooded scenery inside while your lovely music wafts on the breezes outside. 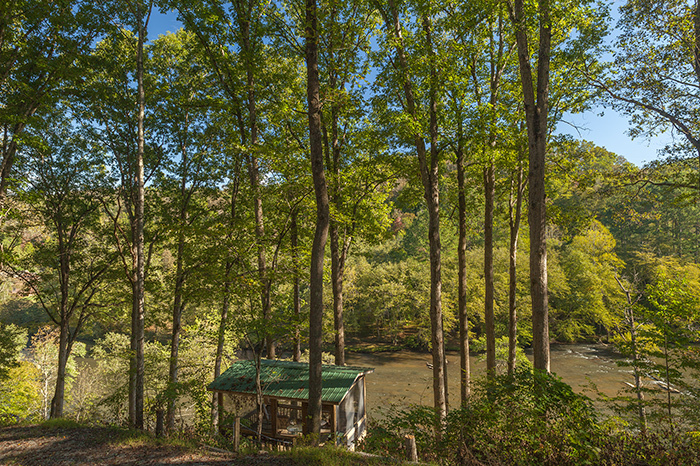 If the outdoors beckons you, a short hike will take you down to the big waters of the Toccoa River. 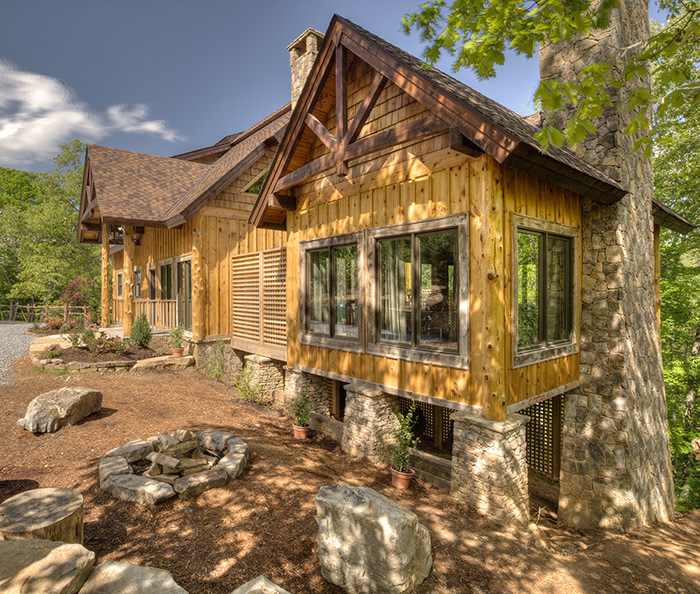 Within walking distance from Mayfly, you will discover a hiking path at Rolling River Cabin, which will take you down to the river. 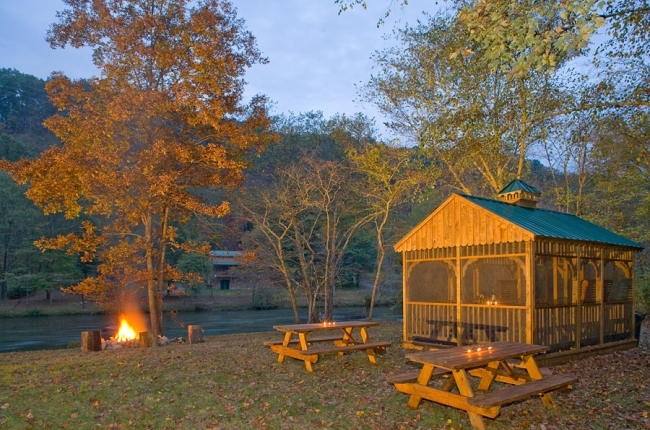 Taking a right at the railroad tracks and going past 3 privately owned cabins, you will discover an open area of about 600 feet along the river offering picnic tables and fire pits. 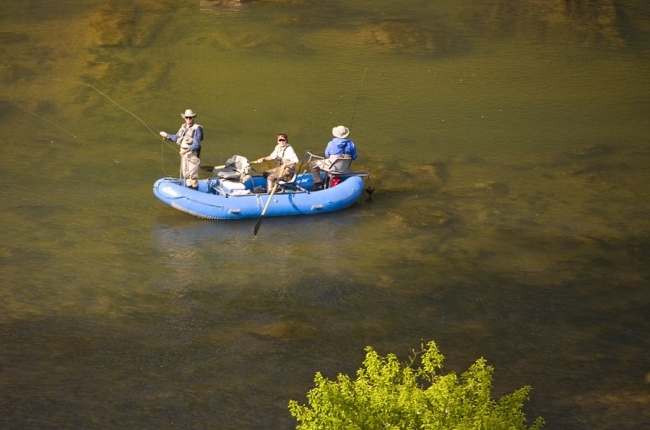 This area is for our guests to enjoy trout fly-fishing right where the Cherokee Indians built their rock Fish Trap, or tubing, canoeing, or kayaking right from the common area of these river properties. 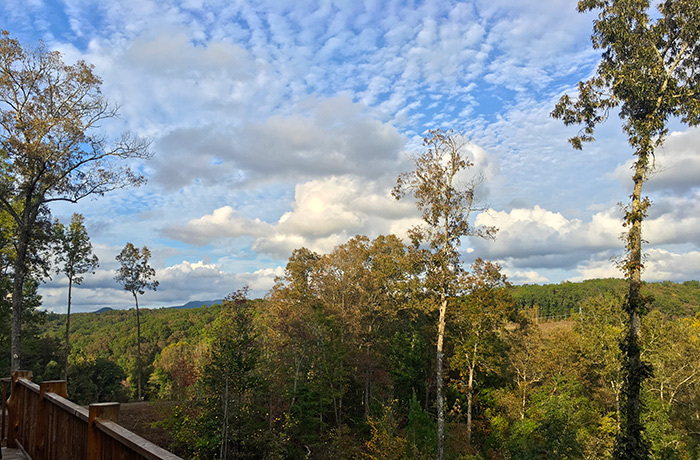 You'll gleefully float northward into McCaysville where a member of your party can pick you up by car. 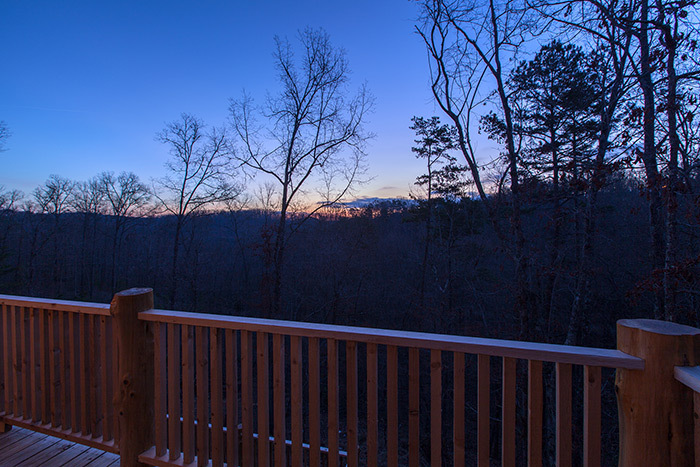 McCaysville is just a short 8 minute drive from the cabin. 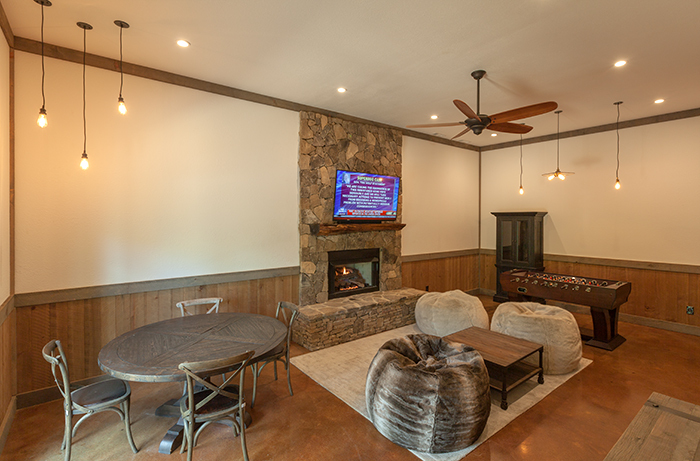 Later in the evening, head downstairs to the terrace level where cozy fur bean bag chairs await you in front of a stone fireplace and large TV. 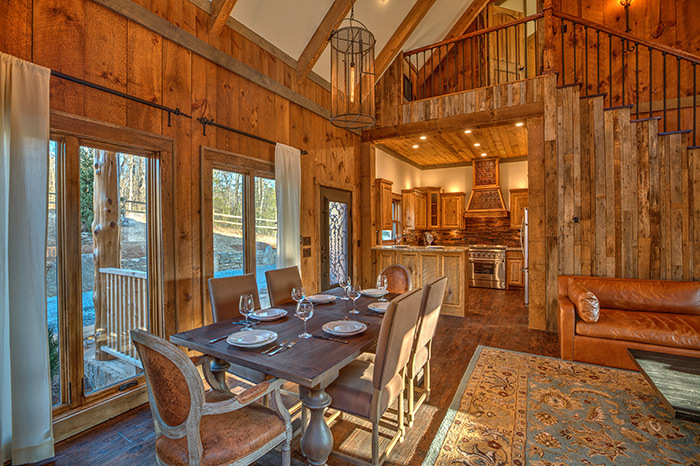 Enjoy working a jigsaw puzzle or playing games at the game table. 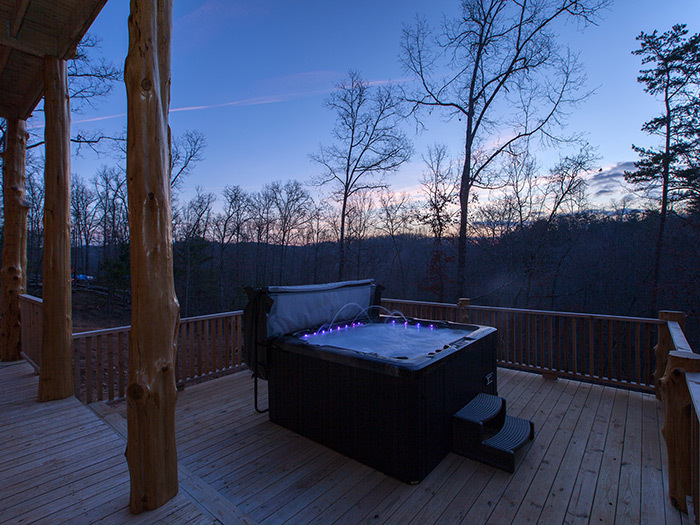 For a romantic soak in the large hot tub under the stars, you will realize that all the cares of the world have quietly slipped far, far away. 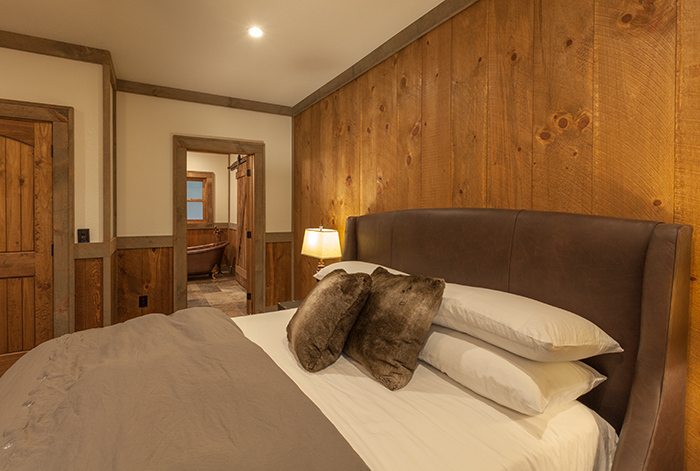 At the end of a gloriously relaxing day, you will find restful repose in the King Bedroom Suites offering luxuriously soft linen sheets and cozy blankets. 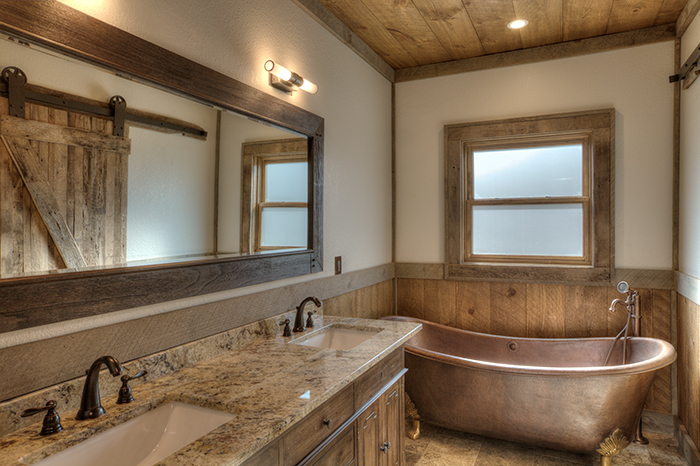 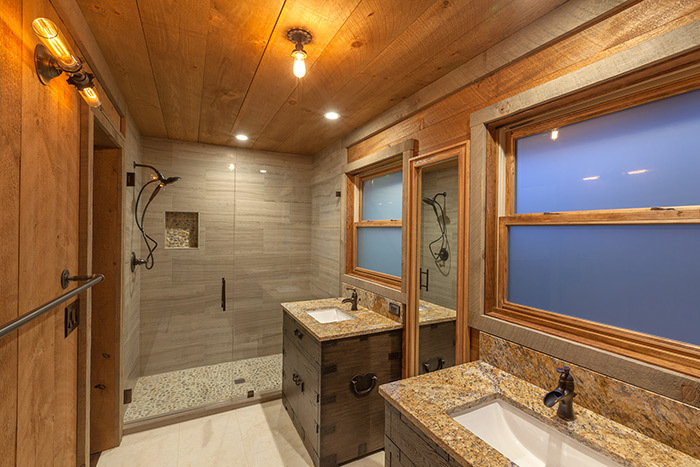 Gorgeously outfitted en suite bathrooms will give you a much-needed pampered feeling as well. 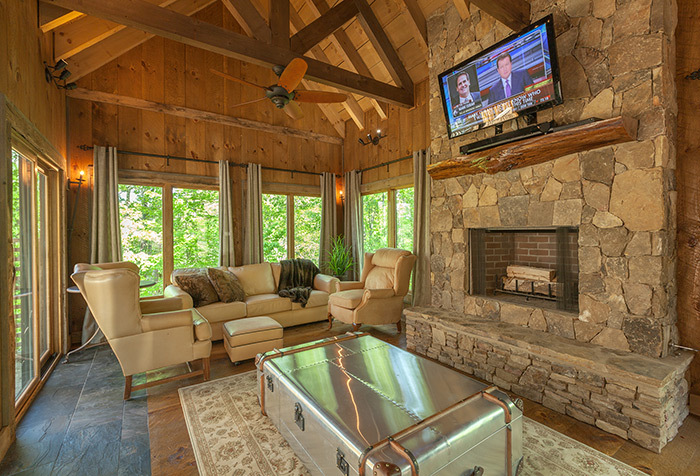 Of course you'll want to take advantage of everything this Toccoa River cabin rental's area has to offer. 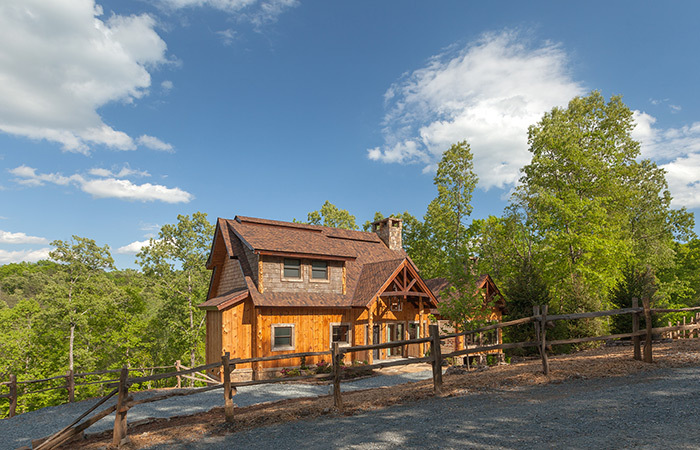 Because of its ideal location situated between the quaint towns of Blue Ridge and McCaysville, GA/Copperhill, TN, and near the Ocoee Olympic Whitewater Center, which is half an hour away, you'll be able to experience unique shopping, bars and restaurants, whitewater rafting and tubing, geocaching, hiking, and mountain biking within close proximity to your cabin. 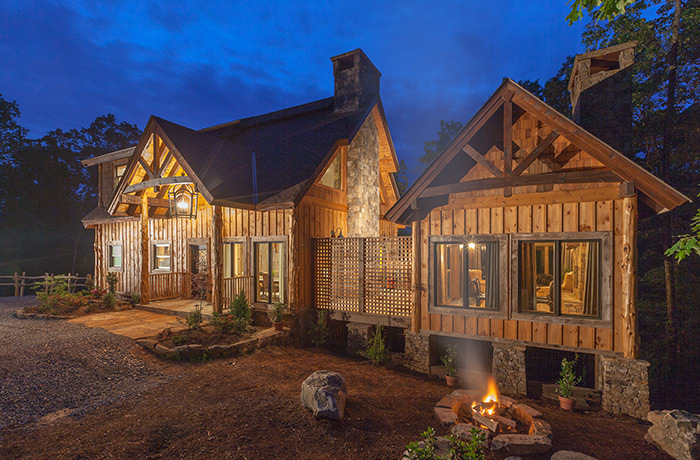 If you are looking to combine a romantic mountain getaway with a little adventure sprinkled in, then you have found your paradise in Blue Ridge, GA at A Mayfly Lodge and Treehouse. 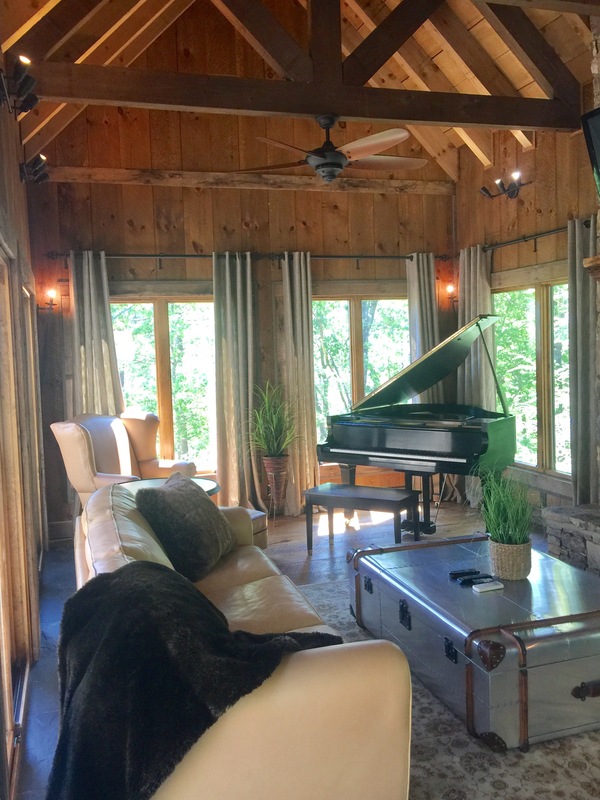 Unique Treehouse featuring a wood-burning fireplace, TV, Baby Grand Piano, large seating area, and dining.